We need to think about this a little, broadcast teachers. Is it really the best thing for the student when you name them an “anchor,” and let them sit behind the desk and read the prompter all semester, or all year? Letting the same kids do all the anchoring for your shows is certainly your choice as a teacher. It might be the tradition you or the person before you established, but is it the best thing for those student anchors? Do your anchors ever go into the field and work on a story? Do your anchors learn to shoot and edit? Do your anchors write their scripts? 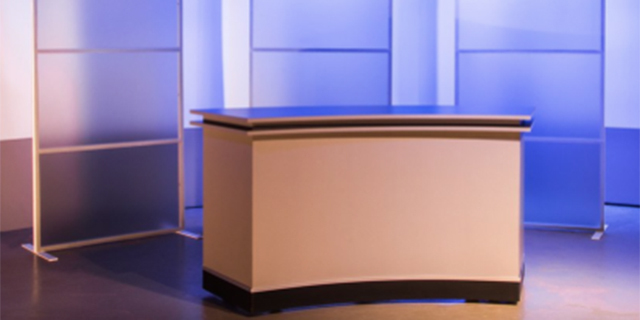 Do your anchors ever run a studio camera, operate the audio board, or create graphics? Do other kids in your class want a chance to anchor? Professional news anchors did not start out as anchors. They were reporters first. They learned to cover news, and tell stories. In fact, many of them today probably carried their own gear, and shot, wrote and edited their own pieces. Every day. Five days a week. To give a teenager the anchor desk, and a sense of power or prestige, is not always a good thing. It might be short-changing them, actually. They have a chance to get a well-rounded experience in your class by doing it all. For those who actually pursue broadcasting in college, this will only help them in the often highly competitive world of collegiate journalism. Finally, there are others to think about when you choose anchors, namely all the students you did not choose. Some kids avoid the camera and want nothing to do with anchoring, but it might surprise you how many others would actually like to take a turn on the desk. In my class I make everyone rotate all the jobs. We change crews about every two weeks. I feel everyone should get to try the desk, and all the other jobs for that matter, at least once. It’s the only way to truly know whether you like it or not. You would be surprised as to what jobs the students end of liking. The downside, yes, our newscast does not look as polished as other schools do, but …they are high school students, not professionals. It also means they will want to goto college and really work on their craft there. I teach a middle school digital media class. We have two main anchors but they must write all of their scripts and green screen their segments with lower thirds. They also must do stories all week. They both have to shoot and edit all of their stories. We also have back up anchors too that are capable of everything anchors do. We have three weather anchors, two sports anchors, an entertainment anchor and then the rest are reporters and photographers who can edit, write and shoot their own stories. We have others who only like to do behind the scenes. However, I put one kid in front of the camera and ended up making him my headline news anchor. (World, state, regional and local news. ) If you organize it right, each kid ends up doing what they want and can fill in when needed. We did auditions and teacher recommendations. I sent a Google Form asking for their top choice. I also let kids submit ideas to sit on the anchor desk with special reports.